What a beautiful, slick drawing. Why don't today's animated cartoons look more like that? What a wonderful world we would live in if all cartoons were that well designed. Did you pitch this idea to any studio? If so, how did they react to it? Wow if I knew that all it took to make it a wonderful world was to draw this way.. Ha! 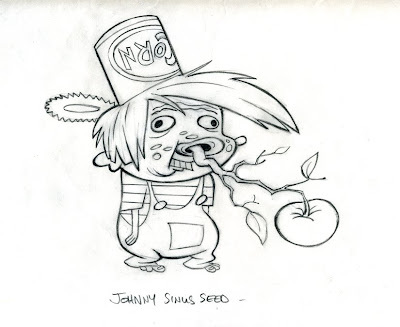 He was part of a larger show concept that we never really got together. Someday maybe I'll find a place for him. HAHAHA! This is great. It reminds me of a story my Mum told me years ago, that if you ate the seed f an apple, an apple tree will grow inside ya. Freaked me out all my childhood… and heres, its come back to haunt me! Ahha..
You should have this guy made into a vinyl figure (they're really popular with today's hipsters). Love the zoned out, ignoramus look he's got. Yeah that's the idea except he put the seed up his nose. If I remember correctly, the idea comes from a guy Jim Gomez knew when he was a kid that did put an apple seed up his nose and it took root. Very painful and he had to have a horrible operation. Thanks for the tip. I wouldn't know how to go about doing it really.